As reported last month Post and Go machine A003 at The Fleet Air Arm Museum, based at RNAS Yeovilton Somerset, has been adapted to provide additional inscriptions in association with a new exhibition entitled ‘Cold War to Kabul’. According to the IAR website, the kiosk will print ‘ZA298’ onto the Machin design and ‘ZD433’ onto the Union Jack design - referring to the Sea King HC4 (ZA298) and Harrier GR9 (ZD433) at the exhibition. Unexpectedly, the additional printing also identifies the aircraft - which doesn't seem unreasonable until you see what a mess it makes of the stamps! There simply is not enough room to accommodate so much additional text on the Flag stamp, and on the Machin the extended inscription overlaps the museum logo and includes the word 'Junglie'. These are most unattractive and demonstrate that you can do just too much to a stamp by way of customising it. Unless properly catalogued - and I'm sure Stuart Leigh will add them to his lists soon - in years to come collectors might even imagine that this is a private additional overprint, and a reject at that! Thanks to RS for the pictures. Totally agree, an awful mess! 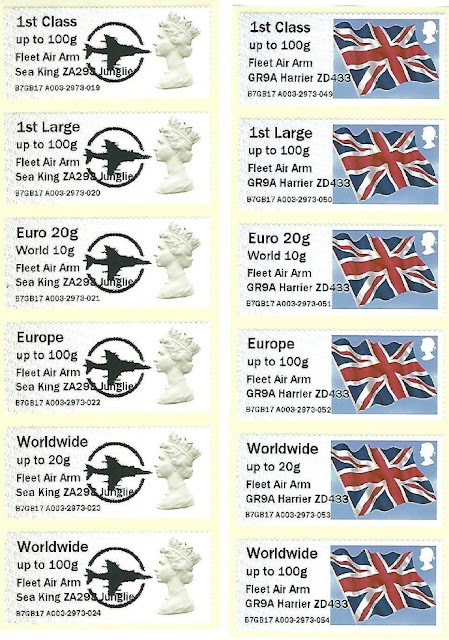 Why does the Sea King overprint depict a Harrier aircraft? A Sea King is a helicopter. You would think the Harrier overprint should have the Harrier jet as part of its design. The Harrier is the FAAM logo which has appeared on FAAM Post and Go stamps since logos were added. A better question might be, why did they not put the GR9a designation on the Machin, and the ZA298 on the Union Flag? Either way the inscription on the flag would have run into the pictorial design., and that on the Machin would have run into the logo. I agree with you Ian. The Harrier overprint would have been better with the Harrier logo on the Machin. Is there not some way the overprint, if made smaller could print over three lines as these are starting to look awful? The Postal Museum Mail Coach had three lines of text with the envelope logo so its not beyond the realms of possibility. However would the text be too small over three lines?